Prototype RFID tables for U.S. Military. Or ... You want it when? A quick turnaround from concept to completion. Customer needed help to design and build two prototype RFID tables for the U.S. Military in 2 weeks. We love a challenge, but this one was a little crazy! Our customer came to us because of our creative reputation and can-do attitude. We held initial discussions with six customer employees and immediately got to work on a design. We built the table from scratch using 1/2 inch thick cutting board HDPE for the base, removable body, sides and internal compartments. 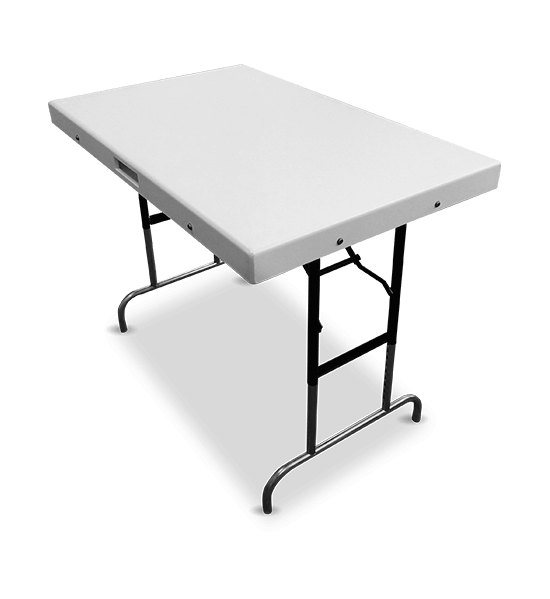 We spec’ed and sourced the telescoping and folding table legs from a trusted vendor. Finally we assembled everything together with tamperproof “Snake-Eye” stainless steel fasteners. The whole project was complete in 11 days. The result was a very happy customer and, god willing, a safer America.